I have created a page and showed a component on that page. I am opening that page in the lightning tab from lightning quick action. I want to call a apex method whenever user close that page either from browser close or from tab close. So to achieve above requirement is there any way? 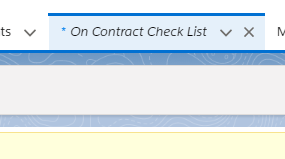 On top of my head you won't be able to call apex when the browser is closed in Native Salesforce. There is JS onunload method that you can try, but it might not always work according to W3Schools. Note: Due to different browser settings, this onunload event may not always work as expected. lightning:tabClosed is an application event that indicates a tab has been closed successfully. This event is supported in Lightning console apps only. Is it possible to show/hide or enable/disable a lightning quick action?